SNAFU! : Did the Joint Chiefs Of Staff (JSC) and Office of the Secretary of Defense, plus the hope for hypersonics team up to push the F-15X? Did the Joint Chiefs Of Staff (JSC) and Office of the Secretary of Defense, plus the hope for hypersonics team up to push the F-15X? Note. I've been trying to keep track of the F-35 vs F-15X saga. Part of that effort has been to determine exactly where the requirement came from. The idea of a missile truck has been around forever and was resurrected in 2018...but even with that the F-35 fanbase launched a campaign to let any and all know that the current Acting SecDef, once a Boeing executive, pushed the idea and that no one wanted it. But today we get a bit of clarity on how this came to be. Check this out from Flight Global. The US Air Force (USAF) is requesting funds from Congress for eight Boeing F-15EX fighters instead of more of its favoured aircraft, the Lockheed Martin F-35A Lightning II stealth fighter, in a move aimed at cutting costs. Over the past year and a half, the Office of the Secretary of Defense and the Joint Chiefs of Staff have come up with the idea as a means to quickly and cheaply replace the USAF’s ageing F-15C fleet, which will be ready for retirement in the 2020s, says a source familiar with discussions around the Pentagon's force planning. "We used the best cost estimate that we had at the time and looked at the various options. The most affordable options – as long as we keep the F-35 absolutely on track with our programme of record – was to look at an F-15 variant to replace the F-15C." 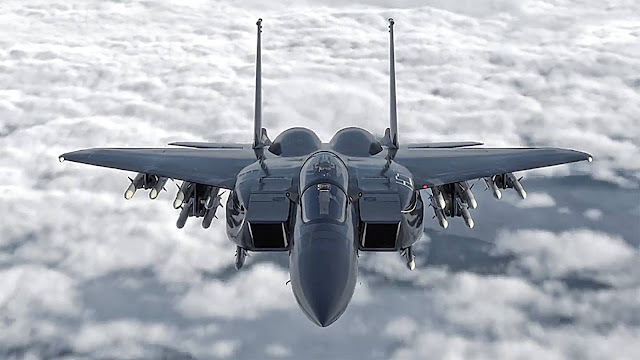 As part of the Department of Defense’s fiscal year 2020 funding request, the USAF is initially requesting $1.1 billion for eight F-15EXs. The service plans to request 80 of the aircraft in total over the next five years, costing roughly $80 million each. The first F-15EXs are expected to be delivered in FY2022. Lastly, the F-15EX is seen as a reliable launch pad for new, larger weapons, in particular hypersonic missiles that will not fit inside the F-35A's internal weapons bay, the source notes. The USAF says hypersonic weapons are still in early stages of development, and that it is too early to know which platforms will be able to carry them. 1. Cost of the F-35. I find this one a bit puzzling. The meme is that a quicker build rate will lower the cost of that plane. Additionally they also say that it is more capable than the F-15, but more on that in a bit. 2. The price point. JCS & OSD are claiming that the price of the F-15X will be around 80 million dollars. This along with maintenance and training are clearly a big win for the USAF. Again, the cost savings claim is weird because of what we've always heard in terms of the F-35 but you already know that song and dance. 3. Hypersonics. This is another curious one. The F-35 is talked about as being able to operate in "beast mode"...everything hanging off pylons when its not necessary to use stealth. They're claiming that the F-15 can carry payloads of this type but the F-35 can't? Weird as hell. But it also points out something else. I've only heard of hypersonic missiles being used in an attack role...against either ships or land based installations. So this is more than continental defense or even acting as a missile truck to carry AAMs. This also includes the strike mission (unless I've misunderstood things). The price of the F-35 is obviously a concern...as well as maintenance. Hypersonics are coming along and they don't see the F-35 filling that mission or rather being able to carry them. If we look at what we've been told about the F-35, none of this passes the smell test. So we're left with a choice. Do we believe the previous information about the F-35 and conclude that they're lying now OR do we conclude that they lied about the F-35 and they're telling us the awful truth now. You know where I stand but how do you see things?